From The Goat – Buster is about to push one cop to flatten another. Can you make out the number over the doorway? Neither could I. It’s 5501. 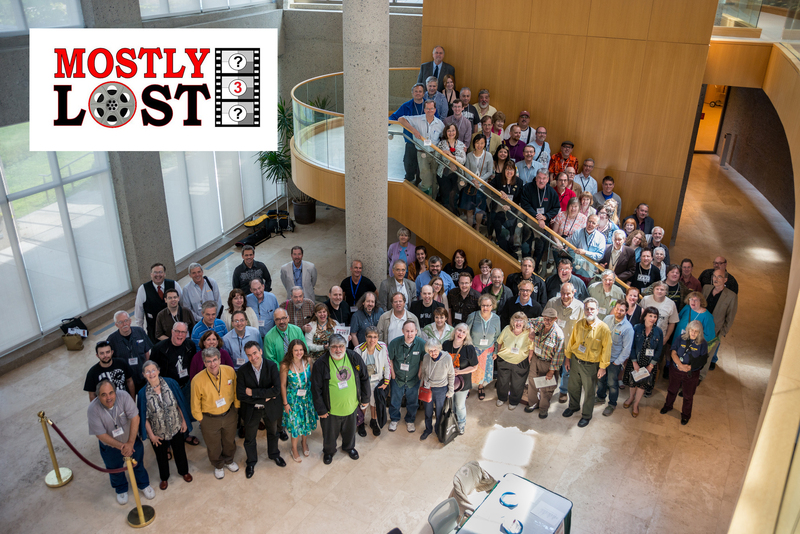 The friendly film experts at Mostly Lost 3.
their expertise with the hope of identifying them. The Goat, obviously, is an identified film, but the setting for the above scene, where Buster rounds a corner chased by one cop, and pushes another cop into his path, had eluded me for years. 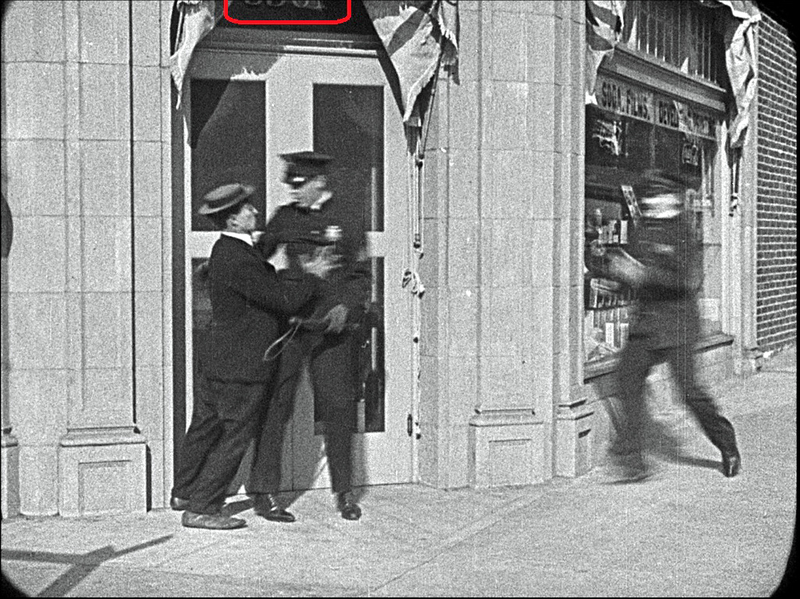 When released on Blu-ray, I was delighted (and frustrated) to see the hint of the numbers above the doorway where Buster stood. They were still undecipherable, but the four digit address meant it was likely filmed in Hollywood, and the sun implied it was a NW corner. For some reason, when glancing through the Mostly Lost Nitrate Film Interest Group on Flickr, I came upon the above image of Bynunski Hymen and Ethlyn Gibson (identified by film author Steve Massa) from a Billy West comedy. While the film remains unidentified, I noticed the background corner doorway looked suspiciously like Buster’s (see inset). 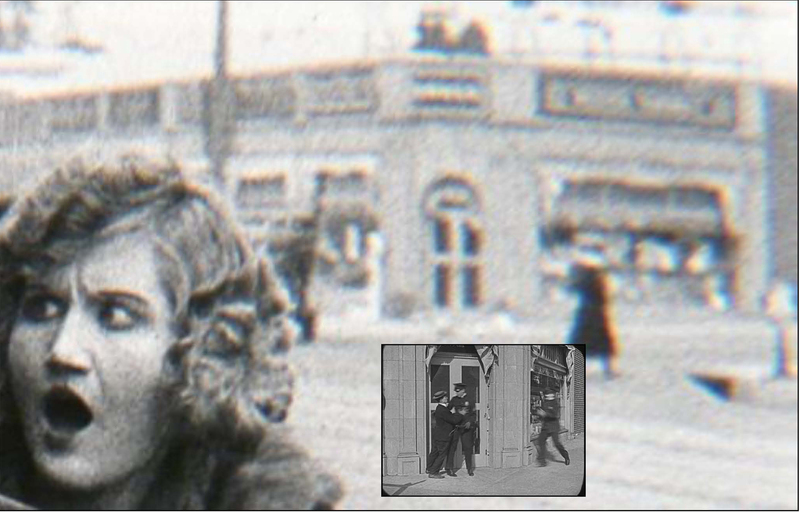 The image provided two essential clues – the corner was on a trolley line and stood east of a white three-story building. At right the NW corner of Hollywood and Western. I studied many NW corners along trolley car lines but grew tired and had no luck. 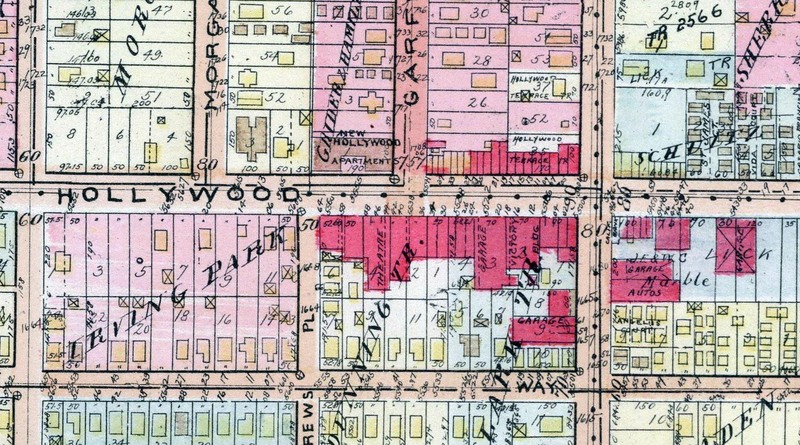 My breakthrough came when I realized the 1921 Baist color atlas for Los Angeles identified brick buildings in red and wooden structures in yellow. I traced the trolley lines along such maps looking only for red NW corners, and finding a limited number of candidates soon had my match. Click to enlarge – looking west down Hollywood Blvd towards the corner of Western. LAPL. When Buster filmed at the NW corner of Hollywood and Western, the New Hollywood Apartments, a white three story unit built in 1913 stood to the west (red arrow above), now replaced by a modern building. 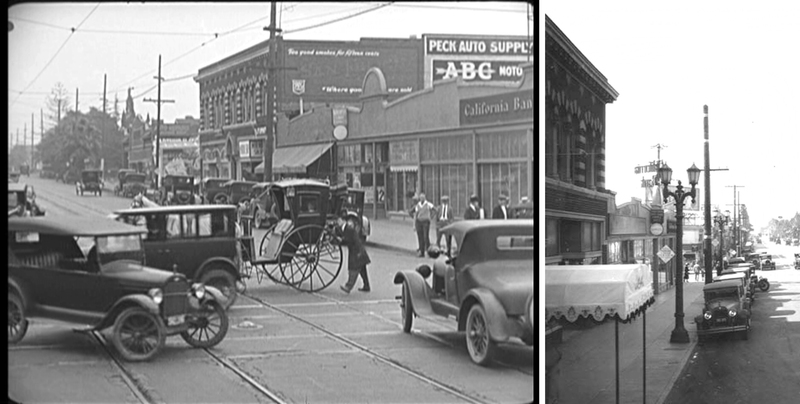 The five story building (crossed out in yellow, above), not present in the movie frame, was built in 1926 and still stands at 5531 Hollywood Blvd. Below, a closer look at the NW corner at 5501. Click to enlarge – looking north up Western towards 5501 Hollywood Blvd. LAPL. 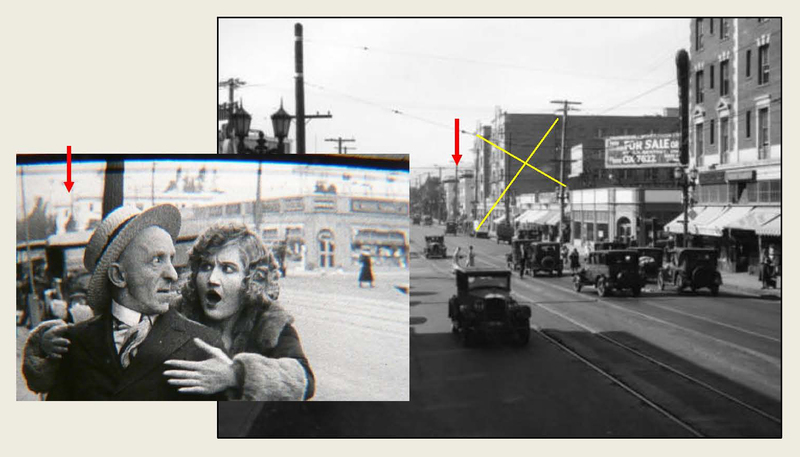 While Buster had his NW corner, it turns out Stan Laurel filmed the SE corner here in 1923 for one of his early Hal Roach Studios solo comedies, Mother’s Joy, looking east down Hollywood Blvd. from Western. The intersecting trolley tracks below, a rarity in Hollywood, helped to solve this location. The distinctive buildings behind Stan appear at the left edge of this matching photo looking west down Hollywood Blvd. Looking east down Hollywood Blvd. from Western. Stan Laurel in Mother’s Joy. LAPL. For better or worse, the intersection of Hollywood and Western has been completely redeveloped, so nothing remains today from Buster and Stan’s films. But thanks to Mostly Lost they are ‘somewhat’ found. A Google maps view of Buster’s NW corner on Western. A Google Maps view of Stan’s SE corner on Western. This entry was posted in Buster Keaton, Stan Laurel, The Goat and tagged Buster Keaton, Hollywood, Hollywood Boulevard, Hollywood Tour, Keaton Locations, Library of Congress, Mostly Lost, Mother's Joy, Silent Comedians, Silent Comedies, Silent Movie Locations, Silent Movies, Stan Laurel, The Goat, then and now, Western Avenue. Bookmark the permalink. A great example of how perseverance pays off. Wonderful work! Another clever find of a location almost lost to history! Great work again, John! John – HOW you do WHAT you do is always both remarkably rewarding and incredibly dumb-founding! Thank you – as always: for your discoveries, the amount of time and work which goes into them and your generosity in sharing the results of your research and amazing expertise.